Nearly every Japanese restaurant in America serves California rolls. Ubiquitous on both high end and low, these colorful rounds go for more than $30 at chichi spots like New York’s Masa, yet many Walmarts stock them in their refrigerated aisles, too. It’s hard to imagine a time when this sushi-bar staple—whose likeness has been spotted on T-shirts, earrings, and pencil erasers—wasn’t an integral part of America’s gastronomic vernacular. 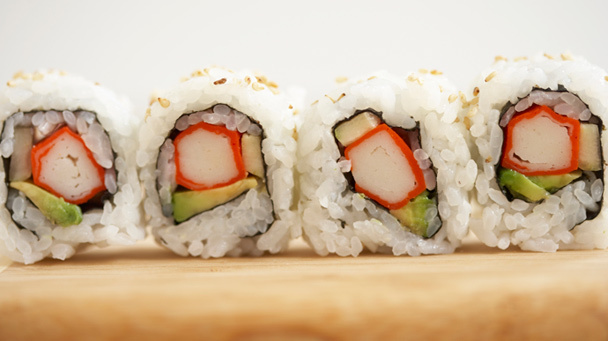 Most food historians agree that the first California roll was served sometime during the late 1960s at Tokyo Kaikan, a restaurant in the Little Tokyo neighborhood of Los Angeles. Executives from the Japanese restaurant corporation EIWA opened Tokyo Kaikan in 1963, at a time when hardly any place in town served Japanese food, let alone raw fish. The cavernous restaurant had separate food stations for teppan-yaki, tempura, and sushi; upstairs, a disco hosted a different band every night, along with a karate show. At first, most customers were businessmen from Tokyo who had come to Los Angeles during Japan’s postwar economic boom and were craving food from home. “The assumption is that because it was called the California roll, it was invented for Californians, but the story isn’t quite that simple,” according to Trevor Corson, author of The Story of Sushi. Instead, this game-changing maki was the product of a gradual—and slightly murky—evolution, as you’ll see. Avocado was hardly a traditional sushi ingredient in the 1960s, but then Tokyo Kaikan chef Ichiro Mashita went seeking a substitute for bluefin tuna to use in toro negimaki, a simple roll made with tuna belly and scallions. (Negi means scallion and maki refers to something that’s rolled up, so while many Americans associate the word negimaki with a beef and scallion roll, it can refer to any kind of roll with scallion.) Mashita often prepared toro negimaki for his Japanese customers—at least, during the months when tuna was available. Services like Federal Express were yet to be invented, so bluefin could only be had during the summer migration. “Mashita was trying to re-create the taste and sensation of tuna belly, so he started with avocado for its fattiness, and then mixed it with king crab meat, to get the seafood flavor going,” says Corson. (It helped that the state’s iconic fruit was inexpensive and sold year-round.) This first California roll was incredibly simple, composed of only the avocado–crab meat mix, scallions, rice, and a nori wrapper; additional ingredients like mayonnaise, cucumber, and sesame seeds were added later as other chefs started experimenting with their own versions. Sasha Issenberg, author of The Sushi Economy, recounts a different story about the roll’s origins. As told to him by Minoru Yokoshima, then vice chairman of EIWA, group owner Kodaka Daikichiro visited Los Angeles during the ‘60s and asked Tokyo Kaikan’s chefs, “Why don’t you make sushi for the Caucasians?” Yokoshima says the chefs responded by serving a roll of king crab leg, avocado, and mayonnaise; there is no mention of deliberately substituting for toro. In his book, Issenberg suggests his own theory for the discrepancy: “Perhaps predictably, EIWA’s current leadership has fashioned…a narrative of institutional ingenuity, in which the creativity comes from the top of the hierarchy.” Because Chef Mashita died a few years ago, and none of his former co-workers contacted agreed to be interviewed for this article, it’s difficult to know which version of the California roll’s origin story contains more of the truth. As the 1960s progressed and Tokyo Kaikan’s renown grew, the restaurant’s Japanese clients began bringing their American colleagues to dine with them. Since eating seaweed paper wasn’t popular among Americans, one of the chefs (likely Mashita, according to Corson) started making uramaki, or inside-out rolls, hiding the nori in the middle and putting the rice on the outside. No one could have predicted the huge impact of this change, yet today, most of the elaborate, American-style sushi rolls are served inside out. “Flipping the roll was a distinctly American invention, but it’s not traditional in Japan because chefs there go to great lengths to crisp their nori just right,” Corson explains. Because the seaweed immediately gets soggy when it’s placed inside, Corson laments the loss of what he calls “the perfect balance of the crunchy outer crust and the soft middle.” But there’s no denying that Americans have flipped for uramaki; today, many people ask for even basic rolls like tuna or salmon served inside out.